1 Peel, trim and cut celery root into 2 cm (approximately 3/4-inch) squares. Add celery root and cover with water up to half the depth of the vegetables. Add a pinch of salt, cover and bring to a boil. Reduce heat and cook for 20 minutes over medium heat. 2 Meanwhile, rinse the tuna fillets and pat dry. Cut into fine dice. 3 Grind or crush pistachios finely. 4 Drain cooked celery root in a sieve, then transfer back into pot on the stove and allow moisture to evaporate. 5 Puree celery root with an immersion blender or in a food processor. 6 Mix in soy creamer, olive oil and truffle oil and season with salt and pepper. 7 Rinse chives and shake dry. Chop finely. 8 Distribute the slightly cooled puree on small plates. 9 Spread cubes of tuna over the puree. 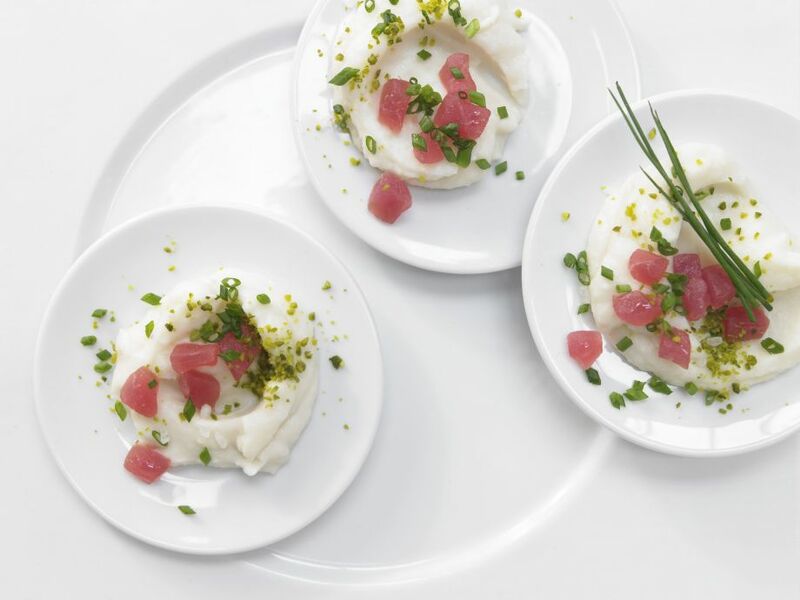 Serve sprinkled with crushed pistachios, chives and the fleur de sel.